MW Mobile Blog: No time to waste. At Will's dock. Seriously weird weather. Hot, high winds and breaking waves. A couple of guys were in a boat in the bay when we arrived. Showed us a 24 inch walleye on a stringer, caught with a jig while fishing for bass. No walleyes left? 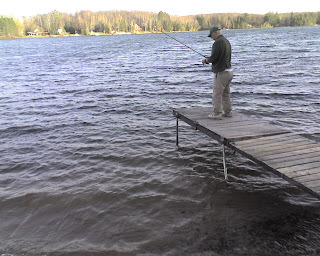 Next thing you know someone is going to pull a foot long perch out of that lake. BTW--no big fish can be caught in the spring? Sounds like a fisherman is a fisherman no matter what season.